Oh that All-Star race. But I am getting a bit ahead of myself. Let’s start at the beginning, shall we? Thanks to an uncooperative mother nature and a dog that gets me up at the crack of dawn ever morning I was able to watch the entire Sprint Showdown live. 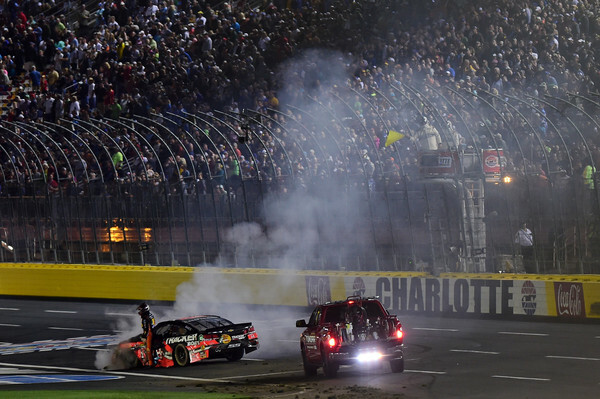 Originally scheduled to run Friday evening the Showdown was postponed along with all other ontrack activities at Charlotte Motor Speedway on Friday. I usually miss at least a couple of the Showdown segments being on the west coast because of work – so it was actually a nice treat to get get to watch the entire showdown start-to-finish. In my opinion the racing in the showdown was good exciting racing- exactly what you would expect from drivers racing for the chance to race for million bucks. That last transfer race between Chase Elliott and Kyle Larson was just good hard aggressive racing that fans want to see at any race! The showdown transfer winners ended up being Trevor Bayne, Greg Biffle and Kyle Larson. Ironically enough the fan vote winner was Chase Elliott and second place fan vote was Danica Patrick both of which also transferred into the All-Star race. Matt DiBurrito ended up being third in the fan vote for those keeping track. Additionally thanks to mother nature the cars had very little time to practice for the All-Star race and qualifying ended up being cancelled as well. That meant that the field for the All-Star race ended up being set by owners points since the cars weren’t able to get in a full practice. Unfortunately this meant that the drivers were unsure what kind of cars they had and were randomly situated throughout the field. Now onto the All-Star race itself. Sigh. The format itself was pretty simple: A 50 lap segment during which the cars were suppose to make a green flag pit stop and change at least two tires. During the break the cars where again required to make a pit stop for at least two tires. A second 50 lap segment – starting positions set by how the cars came out of the pits after the pitstop during the break. Again during this segment all cars are required to make a green flag pit stop and chance at least two tires. During the break a random draw would dictate whether the top 9, 10 or 11 cars would make a mandatory four tire pitstop under caution. The rest of the field is required to stay out on older tires. The third and final segment was a 13 lap shootout to the million dollars. Seems like NASCAR in an attempt to rush a new format didn’t take into consideration the possibility of cars needing a wave around during due to cautions during the race. During the first segment cars started taking green flag pit stops. During green flag pit stops cars that pit early go a lap down to cars staying out on the track. This happened during the race. Then there was an incident on track that caused the caution to come out. There were several cars on pit road at the time. They completed their pit stop and remained on the lead lap. The cars that had already completed their pitstops were then frozen a lap down. During a race these lap down cars that have already pitted would take the wave around to get back on the lead lap because they do not need to pit. Apparently NASCAR didn’t take this scenario into consideration and that is where the cluster started. The wave around cars SHOULD have first been waved around. This did not happen. They were instead all brought down pit road to do their pitting. So the lap down cars ended up staying a lap down because they get all mixed up in the field. Instead of making it right and pulling the lapped down cars (with the exception of Jamie McMurray and Matt Kenseth who should have been a lap or more down – Jamie because of the incident on track and Matt because he failed to make a green flag pit stop during the segment) they just let the lap down cars be. Teams were confused as to why they weren’t allowed the wave around. Timing and scoring got all messed up for a majority of the break- Tony Stewart for instance was shown in 13th on the lead lap and then in 17th a lap down and then back up to 13th and then back again to 17th. The teams didn’t know where they were suppose to line up for the restart. I know that both Tony’s crew chief and spotter tried to get clarification from NASCAR as to why they weren’t allowed a wave around and where they were suppose to line up. The spotter complained that all the officials on the spotter tower were new and didn’t seem to know what was what. The crew chief never got his answer. And then the race next segment was on before it was all ironed out. The crews didn’t seem to know what was going on or why or where to even line up and the announcers didn’t seem to understand what as going on either- stating during the broadcast at one point during the first break that the only cars a lap down were Jamie McMurray and Matt Kenseth when really it was those two and at least six other cars- for nearly half the field. And staring the second segment a lap down basically took nearly half the field out of the running by the beginning of the second segment. I know for a fact that Tony’s team repeatedly asked for clarification. I assume the other lap down teams did the same thing. NASCAR should have taken a couple extra minutes to figure it out instead of shooting right into the second 50 lap segment. I tweeted during the race something to the effect of that if I were a new fan tuning in for the first time to see what this NASCAR thing was all about- I would likely never tune into another race. No one seemed to know what was going on and that was a shame because NASCAR made itself look foolish. If the drivers, crews and fans themselves don’t understand why you are making certain calls (like not allowing the lap down cars to wave around like you do during every other race) then you just seem to be bumbling. If I were a new fan and that was my first exposure to NASCAR it would also likely be my last. I mean the sanctioning body should have thought issues or senarios like this would likely come up and address a procedure for either waving around the lapdown cars or telling the drivers and crews during the drivers meeting that there would be no wave arounds. Another issue that seemed to stick in some people’s craw was the fact that some drivers including Jimmie Johnson were- towards the end of the second segment not pushing towards the front but working to stay where they were in 12-14th position because of the random draw. Some fans were crying out that this was cheating. They weren’t putting their whole 100 percent into the race. I disagree with that and see it more as a strategy call. It’s not different that some cars at super speedway plate races just hanging around towards the back of the pack to attempt to stay out of trouble. Or giving up spots coming out of pit road to gain the lane they want in a restart. It’s totally a strategy call and I don’t see this as cheating at all. 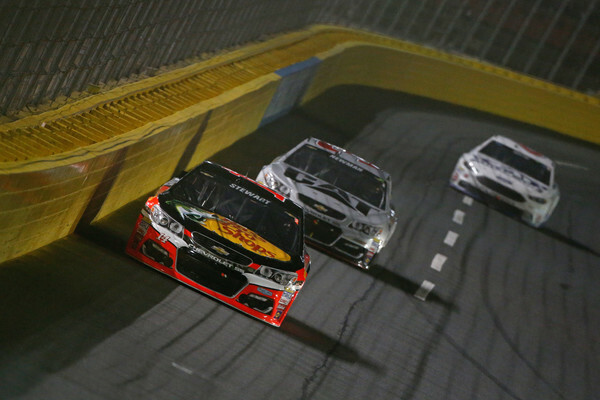 What I didn’t like about the All-Star race besides the huge officiating error? I didn’t like the excessive amounts of mandatory pitstops. I though the pit stop during the first break was completely unneeded and unnecessary (and it was this pit stop that caused the officiating disaster in the first place). To me mandating the pitstops is taking it out of the drivers hands and making it a monkey show. I also didn’t like the ridiculous random draw element to the second break pitstop either. That kind of stuff doesn’t belong in a race. It makes a race seem more like a circus act and less like a race. What I did like about the All-Star race was the same thing I liked about the ShowDown- and that was the quality of the racing. The racing quality itself was really good- especially the end where Joey Logano was running down Kyle Larson. Joey Logano ended up winning he All-Star million. The moment of the whole All-Star race for me (and likely for most Tony Stewart fans) though was Tony giving that command to start engines. It was quite evident on Tony’s face- especially his eyes that giving the command was an emotional moment for him. 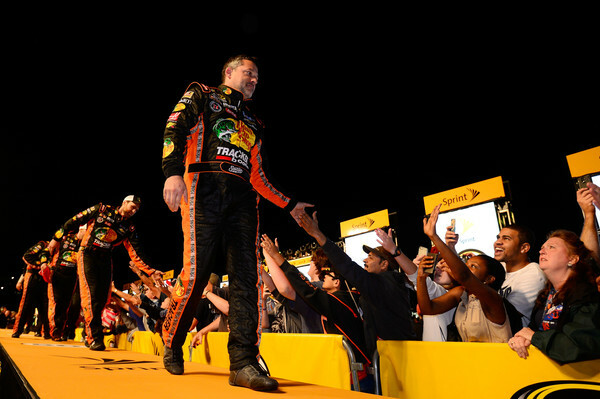 I don’t know about Tony- but for me- that moment made his impending retirement from cup racing all too real. And while I agree with Tony’s comments after his accident- I am sure he will get fined again for them. His eyes did say it all. I don’t think he’d actually stopped to think about the “last” time at some of these events. I almost cried myself watching that. Wish he could have had a better night. Gonna miss this guy in a car. I was so thankful that I had decided not to push my hubby to get tickets for the All Star Race. I had considered it because of it being Tony’s last. If I had paid money to watch that cluster I would have been ticked enough to never watch another race after Tony’s retirement. Why can’t the All Star race be a race. A normal, short race? The MLB, NBA, NHL AND NFL don’t completely change the formats for their All Star events. Why does NASCAR think they need to change theirs?